If you are experiencing pain, please give us a call and we will work to get you in the SAME DAY! Additionally, we offer family block appointments allowing you to bring your whole family in at once. We work hard to ensure every patient has a pleasant experience at our office. We consider every patient here to be like a member of our family and prioritize your comfort; from warm blankets and coffee to affordable, efficient and convenient scheduling, we want you to be comfy and feel welcomed every visit. All new patients receive FREE Whitening For Life! Be sure to take advantage of this new patient special! If you are self-conscious of crooked, yellow or gapped teeth, the majority of cases can be handled without brackets, using clear trays that will create the smile you deserve. Schedule your FREE Dental Implants or Invisalign Consultation today! Our in-house “Wellness Plan” is specifically designed for patients with no traditional dental insurance, and provides discounts on everything from cleanings and x-rays to crowns and fillings. We also work to accept most insurances. From regular teeth cleanings to dental implants and Invisalign, our doctor’s have achieved the highest quality education and only utilize the newest technology. Very efficient and thorough analysis and diagnosis. 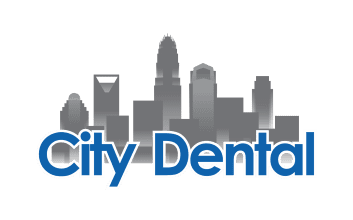 Highly recommend City Dental if you’re looking for a dentist in the Charlotte area. Listens to your concerns and makes sure there is a solution to work around it. Absolutely loved it. Since this was my first appointment with City Dental, I was nervous. But all the staff that I met were so nice and friendly I forgot about my nerves! Dr Walsh was great! Very knowledgeable and down to earth. He listened to my concerns and assured me that things were not as bad as I had assumed. His staff filed my insurance which was one less thing thst I had to worry about. I definitely plan to return! If you are looking for a quick, clean, and responsive office near the city consider checking out City Dental. I was able to have my cleaning and fitting for my night guard within an hour. Everyone is super friendly and knowledgeable.